Last night, beloved and I ate at Teriyaki Boy. I doubt that most of you don’t know or haven’t heard of this resto. For those who don’t, this is a typical Japanese one which you have probably figured out from its name. However, I’ll be upfront with you: I dislike Teriyaki Boy. Not that their food is bad, sometimes it’s good, sometimes it’s so-so. Their prices aren’t that unreachable as well, but it’s still one of those higher-priced ones. In fact, because of their prices, I have yet to try their teriyaki because it’s one of the more expensive ones in their menu. They do have items within reach, and because it was one of the closest from where we were last night, we decided to eat here. Since I’m not really a fan of the resto even though I’ve been to their other branches a lot of times before, I’m not sure if their menu changed if any. I still notice that even though they have it in their name, they still only have a few overpriced teriyaki items in their menu. 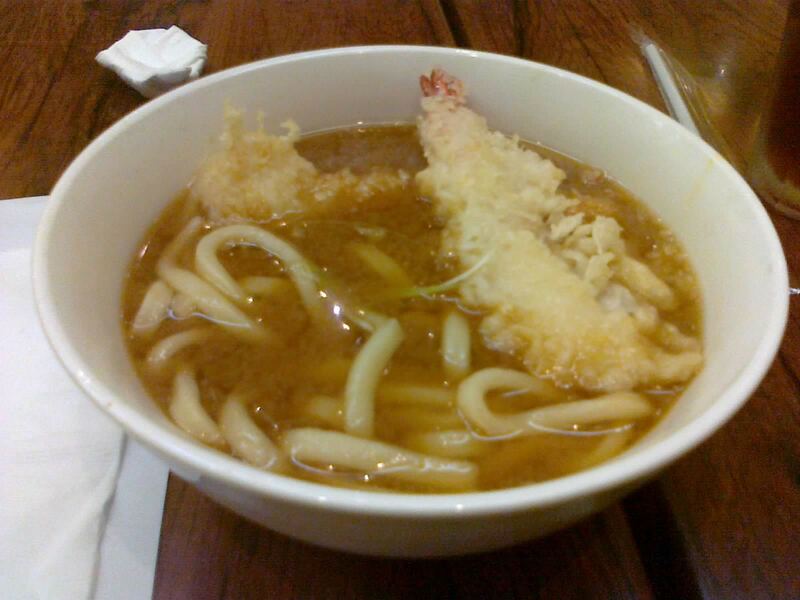 Beloved ordered for herself their Ebi Tempura Udon (195 Php) with a miso soup base (the other choice is soy base). 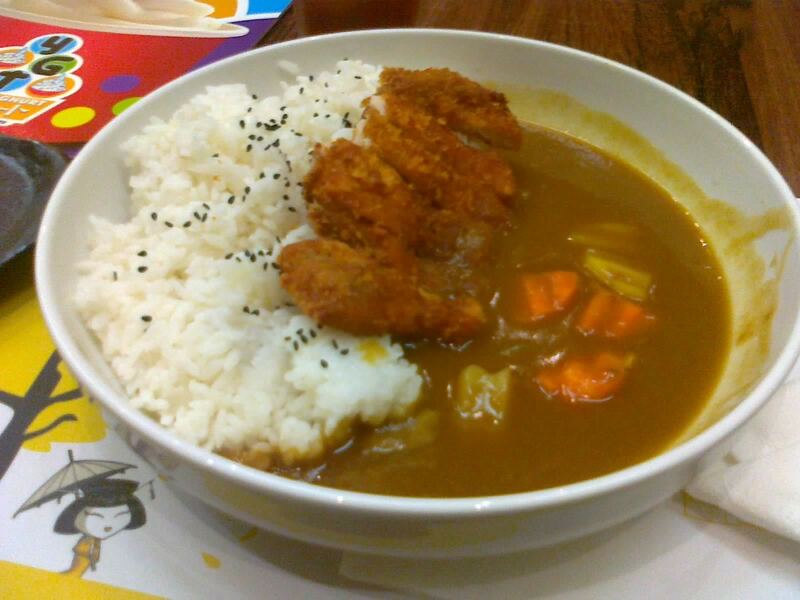 After a hard time deciding, I just ordered their Curry Tonkatsu (240 Php), because I’m still somewhat craving for curry. Beloved’s order came first. The shrimp was not bad. The udon was not bad as well. The soup was distinctively miso, which was soothingly good. However, as with most of their items, I found that the serving size is not as generous as I would’ve liked it, especially with its price. It doesn’t even have anything other than the noodles and the shrimp, as I would’ve preferred some veggies in my soup. Beloved explains that she likes her udon plain, so I guess she’s happy with this. As for my order, well, don’t let the picture fool you. Yes, there is a lot of sauce and a lot of rice, but the piece of pork that’s included there was almost half of the one served in Bubble Tea. Still, I thought I’d be happy since there was a lot of sauce. Sadly, this one had a sour taste that overpowers the curry. The taste and texture of the pork was the saving grace, but if I wanted just the pork, I should’ve just ordered their tonkatsu or katsudon. Yes, once again, Teriyaki Boy proves to be one of the more mediocre Japanese restaurants I’ve tried in the metro. Sometimes, they do good with their food (for example, with beloved’s miso soup), but most of the time they screw up (as with my sour tasting curry). Other complaints from this resto from past experiences include lousy and slow service, mixed-up orders, and barely affordable prices. Maybe their teriyaki really is the one you should go here for, but I’m not someone you can ask about that because I have yet to try it because of how they priced it. Sadly, while I prefer to not go here anymore, especially since Tempura Japanese Grill is just across the street, this happens to be one of the we-have-nowhere-else-to-go-so-let’s-just-eat-here kind of restaurant just because of its name and service hours (which runs pretty late), so I don’t think this would be my last time going here. Location: Tomas Morato, across McDo. Recommended for: Late-night Japanese food cravers (although I would rather point you to Sushi-Ya, which runs later). Not recommended for: Budget eaters, Japanese food haters, quality Japanese food lovers. Smart nomnomnom tip: Save this place as a last resort.